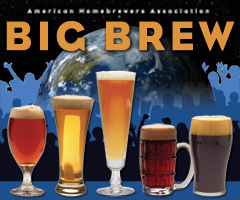 Big Brew Planning | Saving Utah one brew at at time. Once again, none of the suggested recipes seem to move me. I will probably brew something different. I am thinking about some type of sour beer. I haven't decided if I want to do a beer with bugs, like a lambic or Flanders Red, or if I want to work on a sour mashed beer like a Berliner Weisse. The Berliner Weisse may win out, because it will be ready to drink much sooner. This is because all of the souring will be done in the mash and not in the fermentation. Probably not as complex in the flavor profile as something fermented with bugs. I will do a five gallon batch of whatever I finally decide on. Make sure that you are there to join in on the fun.